For the past year or so Raymond Chandler aficionado Loren Latker has been working to have the ashes of Cissy Chandler reunited with the remains of her husband Raymond Chandler, who is buried in Mount Hope cemetery in San Diego. Loren has spent quite a lot of time investigating Chandler’s relationship with Cissy and his detective work helped with putting together my post last year to commemorate the 50th anniversary of Chandler’s death. 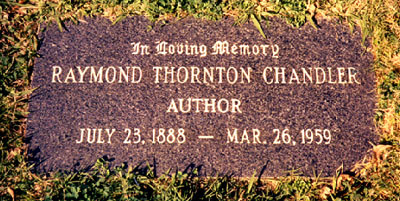 Loren has a useful Raymond Chandler timeline on his Shamus Town site which corrects many errors and omissions from the two Chandler biographies. Update 18.03.2010: Loren is starting an email campaign to persuade the judge that the Chandlers should be together. He says “Have people email me and cc Aissa Wayne at aw@waynelawgroup.com, and tell us that they wish to see Pearl Cecily Eugenia Chandler reunited with Raymond Thorton Chandler.” Update 8.04.2010: A campaign web page, which includes copies of Raymond Chandler’s will and codicil, is here. Loren explains more about Cissy’s family, about the process of having her remains moved in this segment from his wife’s show on Talk Radio One. Updated 09.09.2010: Yesterday the San Diego court granted the petition to have Cissy’s remains moved to the grave of her husband. More here.